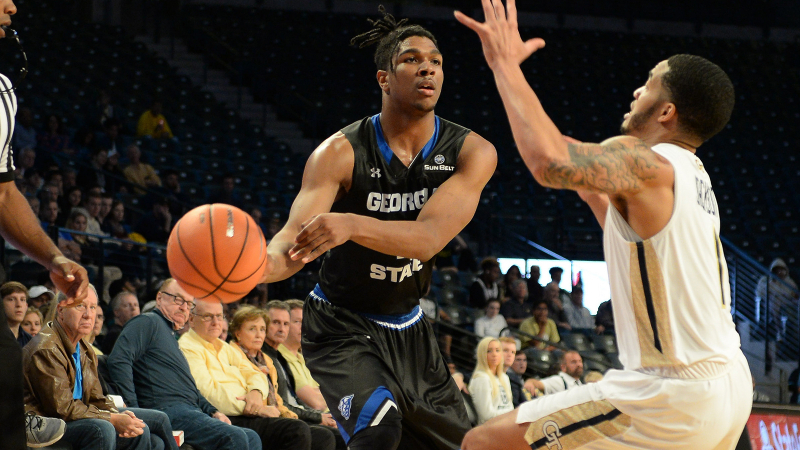 The Georgia State Panthers faced off against the Georgia Tech Yellow Jackets for the first time since 2008 in the ‘A-Town Showdown’ for Hurricane Relief. Behind D’Marcus Simonds’ 30 points, the Panthers proved why they should be crowned the best college basketball team in Atlanta with a 65-58 exhibition win over the Yellow Jackets. The exhibition match between the was established just over a week ago, and the proceeds from the game will go toward the hurricane relief efforts that dismantled parts of the country and Puerto Rico recently. The Panthers played a well-rounded game the entire game. In fact, the only time they trailed during the game was in the first quarter when the Yellow Jackets had a 4-2 lead. The Panthers quickly erased that deficit with a 9-0 run with 14:05 remaining in the first half. Simonds proved why he was apparently the best player on the court for the Panthers by attacking the rim with force, knocking down mid-range jumpers and connecting from long range. Junior forward Malik Benlevi also played an integral part in the Panthers’ victory Saturday, scoring 13 points and snagging seven rebounds. Junior Jeff Thomas maintained his reputation as the Panthers’ sniper from deep as he had 12 points and also grabbed seven boards of his own. The Panthers’ biggest lead of the game was 11 (25-14) on a three-pointer by Thomas with 7:51 remaining in the first half. However, the Panthers went into halftime with a 36-31 lead. To begin the second half, the Panthers went on an 8-0 run to push the lead to 44-33. With 14:46 left in regulation, freshman point guard Kane Williams knocked down a free throw to give the Panthers a 50-38 lead which was the largest lead of the game. The Panthers will host Lees-McRae College in the second of three exhibition games on Thursday at 7 p.m. at the GSU Sports Arena.